There are many over-the-counter medications to help relieve heartburn or mild acid reflux, also known as gastroesophageal reflux disease (GERD), symptoms. These medications neutralize and reduce stomach acid that can cause symptoms, such as burning or pain in the chest and regurgitation of food or sour liquid (acid reflux). Antacids work to neutralize acid and help relieve heartburn, acid indigestion and upset stomach. These can also be taken to help relieve the pain from stomach ulcers. Make sure to read the manufacturer’s directions to know when, and how much, to take. If you take chewable antacids, make sure you chew them well before swallowing for faster relief. Some side effects can occur if you overuse antacids, such as constipation, diarrhea, changes in the color of bowel movements and stomach cramps. H2 blockers, or histamine antagonists, reduce the amount of stomach acid produced by blocking the chemical histamine. Histamine is a natural chemical in our bodies that stimulates stomach acid secretion. H2 blockers don’t work as quickly as antacids, but they provide longer relief from heartburn and acid reflux/GERD symptoms. Initially these should be taken in high doses (twice a day for four weeks) and then be reduced (once a day for 6 to 8 weeks). Side effects from H2 blockers are minimal and rare. Side effects may include mild headaches, dizziness and diarrhea. Serious side effects may include confusion, chest tightness, bleeding, sore throat, fever, irregular heartbeat, weakness and unusual fatigue. If you experience any of these serious side effects, you should contact your doctor immediately. If these over-the-counter H2 blockers do not help relieve your symptoms, your doctor may be able to prescribe stronger forms of these medications. 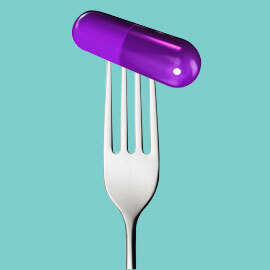 PPIs, also known as proton pump inhibitors, reduce the amount of stomach acid by blocking production made by glands in the lining of your stomach. These also allow time for damaged esophagus tissue to heal. While you can get these medications without needing a prescription, do not take PPIs for occasional heartburn. PPIs are meant to relieve chronic issues with acid reflux/GERD. If these over-the-counter medications and subsequent prescription medications do not help relieve your heartburn or acid reflux/GERD symptoms, you may have a more serious condition and further investigation with an endoscopy may be recommended.